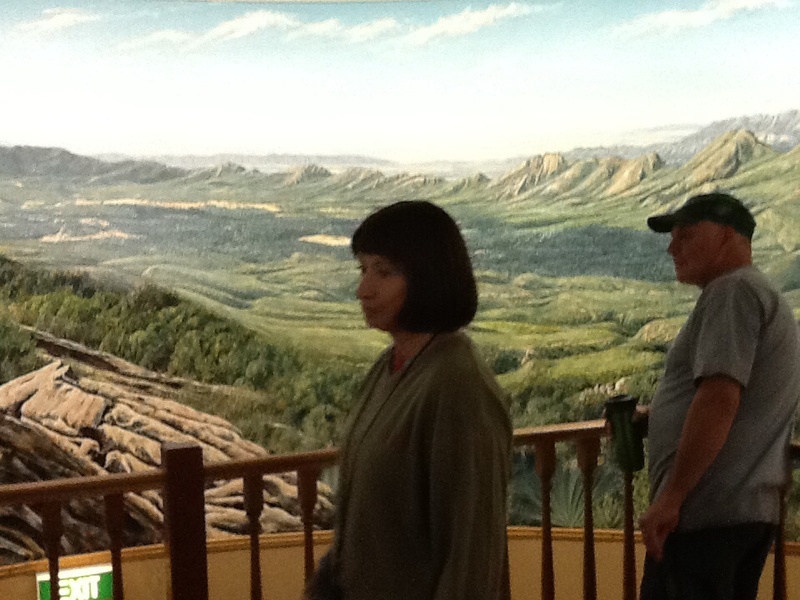 In Hawker, on the edge of the Flinders Ranges, the artist Jeff Morgan was inspired to paint a round panoramic mural of the Wilpena Pound landscape. The work is astounding. It is also unique. It is the only cyclorama, or 360 degree round panorama, depicting a real view as seen from one viewpoint. Jeff’s work allows the viewer to experience the view from St Mary’s Peak as he has seen it. And what a view! As I climb the wooden steps in the centre of the tower that houses the work, I am inspired. The vista is stunning and he has reproduced it faithfully, and yet in an interpretation that is his and his alone. What an artistic challenge, but I should not be surprised. 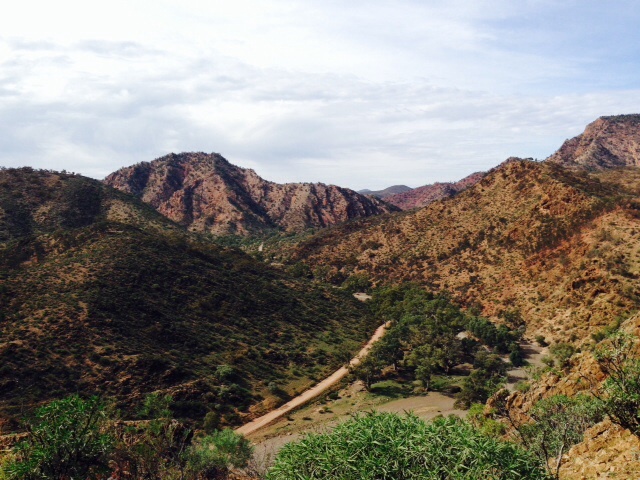 This country, the Flinders Ranges, inspires. Views stretch to the horizon in every direction. The scale belittles any mundane worries and petty cares. The ranges are majestic in the true sense. In shrinking our own self importance, I think they may they have the potential to inspire us to greater works than we could otherwise imagine. Looking to the left on the drive out of Hawker, the land is flat and stretches into infinity towards the horizon. It is dotted with flinty silver, green and grey vegetation. To the right, the landscape is dramatically different. The land has rippled over millions of years under pressure from movements in the earth’s crust. Massive rocky ranges have been forced into existence. Ancient sea beds have been uncovered, and limestone eroded to allow pink, yellow and grey rock to emerge on the surface. We are on another planet. We take a short detour off the highway to one of Howard’s special places, and clamber up a stony incline to search for the fossilised remains of the sea creatures who lived here many millions of years ago. The rocks here are said to be between 500 and 650 million years old. 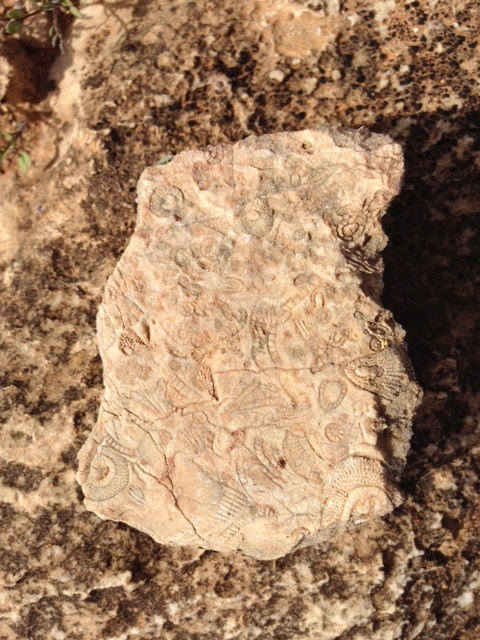 We find intricately etched fossilised remains that in the delicacy of their ancient patterns suggest a hidden artist’s hand. Then when we reach the top of the rocky outcrop and gaze at the 360 degree views, we marvel at the shapes carved into the earth by dried river beds and the deep pink and ochre hues of the distant mountain ranges. Is nature the greatest artist? Lunch time brings us back to earth and we visit the Prairie Hotel at Parachilna where we sample the feral antipasto plate. Emu, goat, kangaroo and camel are transformed into tasty smoked sausage, pate and cured meats, eaten with soft damper style bread. The walls of the pub are hung with brightly coloured indigenous artworks. The inspiration for their dots, swirls and line work taken from the natural world around us. We leave the bitumen for unsealed roads at Lyndhurst and watch for swirls of dust approaching in the distance from oncoming vehicles. The leaders call out warnings on the radio as motorbikes and the occasional ute approaches. The ranges disappear behind us. The horizon seems to become more and more distant, the land flatter and flatter. This is the Australian outback. The sun sets in dark oranges, pinks and yellows that reflect back the more muted colours of the rock. The day ends at Marree, at the start of the Birdsville Track and tomorrow is another day. This entry was posted in Art, On the road and tagged Australia, Flinders Ranges, Outback, Travel on 20/05/2014 by Deb McSephney. Love the descriptions in the blog! Can’t wait for the Birdsville Track! Your elegant prose Debs…it leaves me wanting more. How are you getting on with the inflatable shower curtain? You are right Deb the Flinders are awesome and beautiful – just missed you there – returned to the Marsh May 18. Love to all on the trip, and hope you and Richard have had many successful showers – or is that shower standing glowering at the big sky somewhere – un-captured and unconstrained? The shower may have to tell its own story one of these days… Thanks for reading Deb. Lovely. Very evocative descriptions of the land. What a magical place. It is a truly magical place, who could help but be inspired. Thanks for dropping by Martin.